Chicago: Daniel Mellis, 2011. Edition of 125. 12 x 9.25"; 64 pages with a four-page gatefold and seven transparent leafs. Bound with a two-signature cased-in bradel structure. Pictorial paper boards with cloth spine. Numbered and initialed by the artist. 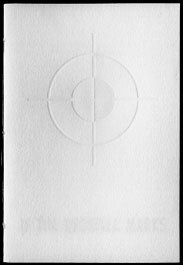 Daniel Mellis, Medium/Technique: "The book was printed with a combination of processes: HP Indigo was used for most of the book except for the transparent pages, which were laser printed, and except for the silver of the spine label, cover, and colophon, and the cover press varnish, which were letterpress printed. 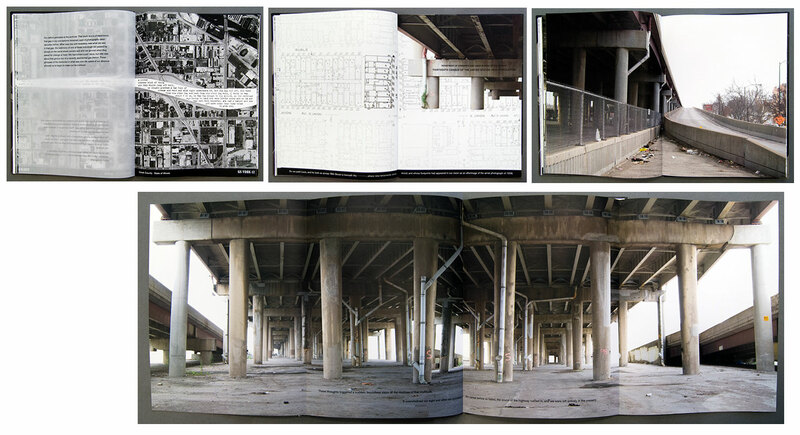 "The multipoint perspective panoramic photographs from beneath the Dan Ryan Expressway were taken and digitally manipulated by the artist. The historical aerial photographs were obtained from the United States Geological Survey, the Illinois State Geological Survey, and the Illinois Department of Transportation. The map is a composite of Sanborn Fire Insurance Maps from 1914. "The text in the book is a combination of a fictional narrative written by the artist, excerpts from an interview with a homeless man who grew up in the area and who was living beneath the highway that is featured in the book, and detailed demographic data from the 1910 US census." Colophon: "In 1956, the Federal-Aid Highway Act was passed, initiating the construction of what is now known as the Dwight D. Eisenhower National system of Intertate and Defense Highways. "In Chicago construction on the Dan Ryan Expressway began in 1957. The road opened in 1962." 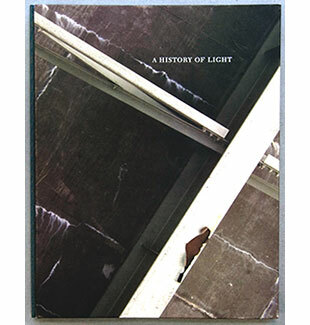 Daniel Mellis: "A History of Light explores the relationship between memory, photography, historical documents, and the inaccessibility of the past through a poetic examination of the negative space of the Dan Ryan Expressway in the Pilsen neighborhood of Chicago. "A science-fiction narrative tells the story of a group of people who have become blind to a section of highway: they miss exits they could have sworn existed but cannot name and suddenly find themselves across the river from their destinations. In their attempts to understand their logistical difficulties, they look to the archives, and discover in historical aerial photography a second sight. They see, instead of the highway, stories about the neighborhood's past; stories that are excerpted from the artist's interview with a homeless man from the area, living beneath the highway. Louis Rubio becomes a character in the book, and guides them to beneath the overpass, where their second sight reveals, in the highway's substructure, detailed demographic information from the U.S. Census. They are overwhelmed by the enormity of the unrecoverable past; their blindness and vision fade; and they are left in the present." Chicago, Illinois: Daniel Mellis, 2009. Open edition. 2.5 x 3.5"; 6 pages (unpaginated). Handset Monotype Perpetua printed on Mohawk Superfine with Bugra covers. Trifold with a sewn paper cover. eloquently expresses the right of a landowner to control the earth below his/her property and the air above it. 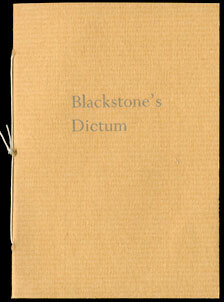 "The text of Blackstone's Dictum leaves out 'et' - Latin for 'and' - because the conjunction is created by the structure of the trifold." Chicago, Illinois: Daniel Mellis, 2009. Edition of 100. 3.75 x 5.5"; 6 leaves. Letterpress printed using photopolymer plates. Handsewn pamphlet binding. Daniel Mellis: "If the register marks are in register was inspired by an expression by the great offset printer Richard Benson. This expression - If the register marks are in register that only means that the register marks are in register - is meant as a reminder to the printer. "Because register marks are the small lines or figures on a printing plate that aid the printer in correctly aligning multiple colors on the same sheet, if the printer focuses on them he/she will neglect what is important: the image being printed." Chicago, Illinois: Daniel Mellis, 2009. Edition of 200. 3.25 x 4"; 14 leaves (unpaginated). Offset printed tritones with letterpress printing on the cover. Spiral bound. Daniel Mellis: "Columns of Chicago documents an architectural phenomenon in Chicago: the isolated column. The function of the columns ranges from memorial to commemorative to artistic. Narrow pages [six 1 x 4" pages separating the tritones] provide historical information above each of the pictured columns. 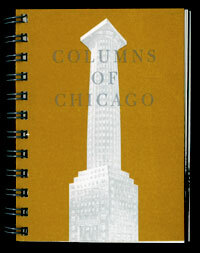 The cover column was never built; it was Aldolf Loos's entry to the Tribune Tower design competition of 1922. "Columns was printed in black, gray and brown inks. The brown printing plate was created, not to tone the image as in standard tritone, but to pick out brown and orange elements in the original scene."